Does Bounced Email Mean All the Recipients Didn't Get My Message? - Ask Leo! I sent 4 recipients an e-mail. As it turns out, I got a notice from MAILER-DAEMON that the address was not deliverable. I know it is because they changed their address, which I wasn’t aware of. Should the other 3 recipients have received the e-mail? This situation occurs once in awhile, because people don’t always tell quickly enough when they change addresses. So, my question in essence, like with tree lights, if one fails, do the others stay lit? In your case, it’s fairly clear: the message was probably delivered to the other three recipients. Things also get more complicated because you’re not even guaranteed to get a bounce-back message if something goes wrong. Email makes several stops along its path from you to your recipients, and, of course, an error can happen at any point along that path. Where along the path it happened. The key in every case is to carefully read the error message for clues as to what broke and where. Some errors are generated by your email program when you press the Send button. These types of errors include anything that can be detected before sending, including a malformed email address, improper account configuration, or a misbehaving mail server. In these cases, the mail never left your machine, and hence wouldn’t make it to any recipients. Some email programs create their own “bounce” messages in this scenario. Rather than popping up an error message immediately, they manufacture a faux-bounce in the form of an email message placed in your inbox. By “your mail server” I mean the mail server your email program contacts when sending mail. Typically, that’s the “SMTP” server setting, and the configuration information will have been provided to you by your email service or ISP. Bad account information, such as a bad username or password. Bad account configuration, such as a bad mail server name, port, or security requirements. Something about the message itself, such as some kind of early spam detection or size limits of some sort. Regardless of whether it comes to you as an immediate popup or a bounce, the error message will tell you exactly what’s wrong. Read it carefully. Failures at this stage prevent all copies of the email from being sent; the message still hasn’t left your machine. 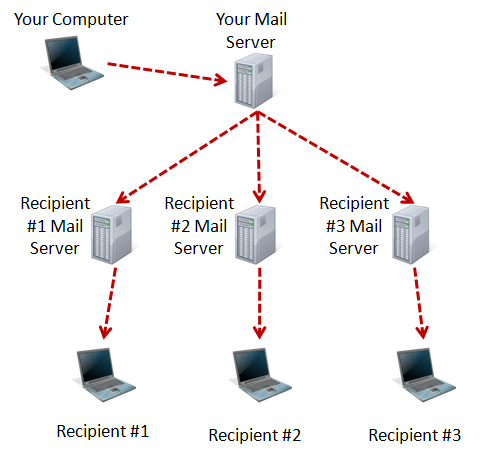 Your email server can’t contact the recipient’s email server. The recipient’s email server refuses to take delivery of the message. In the first case, you’ll usually get a bounce from your email server telling you it was unable to contact the remote server. The bounce message will come “From:” your mail server. Depending on the error, you can get the response immediately, or it can take several days for the mail server to give up. The recipient’s mail server thinks your email is spam. The recipient’s mailbox is full (or “over quota”) and cannot accept any more mail until it’s cleaned out. The recipient’s email account has been closed and no longer accepts mail. You’ve typed the recipient’s email address in wrong. Regardless of the reason, if the email has reached this point, each failure is per-recipient, meaning some of the emails will make it, and others — the ones that result in an error message back to you — will not. The key here is that the error message will specifically reference one of the email addresses you attempted to send to. It’s that address that has the problem. Bounce messages can be confusing. There’s often a lot of technical gobbledygook making the message difficult to understand. Please take the time to read it anyway. Quite often, the error will be buried within that mess: brush the mess aside and the reason for the failure becomes clear. Unfortunately, sometimes bounce messages are the equivalent of “It didn’t work”, with no additional information as to why it didn’t work. When that happens, the best you can do is to use the information in the “From:” line of that message to see which server along the sending path generated the error. Use the information above to make an educated guess as to what might have gone wrong, and whether it’s something you can fix. Finally, it’s possible you won’t get a bounce message at all, and your email will not be delivered. The problem is spam. Since so much spam is sent to invalid or blocked email addresses, the load of sending bounce messages for every such message can become overwhelming. As a result, many email services elect not to send them at all. There’s little you can do when this happens. If you suspect your email hasn’t made it through, about all you can do is ask your recipient — using a media different than email! « Previous post: People often use free email providers for critical data only to lose everything when a problem occurs. I had various problems this week with e mail in hotmail and yahoo, yahoo saying faults all week. I tried to put controversial issues about health on yahoo answers and ended blocking some responses but they still talk. I have just been asked to rate best answer from those seeing my point. Other day Hotmail also gave lots of fail deliver messages about the stuff I sent to all Barnadoes addresses as supporter. Now I have stuff on Ether books iphones; I have usually got replies from MD M Scott and technic man M Jones about new stuff this week. But today the message sent to M Jones about 10 pm came back as if sent to me by myself. I have seen sent box said sent to him. I have just told him this fault and reported it to submission team, asking if it is indirect message I should talk to submit team, if he is busy. Is hotmail again blocking me sending messages? I put issue on twitter and facebook. It’s dangerous to include an email address in a post to a public forum, it could open the door to receiving spam. Including your password makes you vulnerable to someone getting into your email account and taking it over. Now that some people have seen your email and password, it would be a good idea to change your password and security question. Not exactly on topic but let me try asking. I restored Win 7 on a neighbor’s computer (that she’d allowed MS to upgrade to 10). Everything works except my emails to her Road Runner email account don’t reach her. Other emails do. I don’t get an error message telling me of a bad delivery. I assume the emails got through … until I go back to her computer and find none of them in her Inbox or Junk box. Our concern is, who else is sending her email that’s not getting through? That “Bad Delivery” message should have additional information about the cause in it. If only there were a “Bad Delivery” message. No, it appears the email was delivered fine. But at the receiver’s end – and she’s using webmail, so client software can’t be responsible – the email just doesn’t appear. Not in Spam/Junk either. When an email is sent to both her RoadRunner and Gmail addresses, only the Gmail account receives it. I’m certain the RR address is correct, as I use “Reply” to an email I got from her RR account. Forgot to mention that her emails to me DO get to my Inbox. And that when I send an email to her, it’s with Reply, ensuring I have her correct address. Emails sent to a distro list from a gmail account at a school gets a bounce back message that says “message rejected from _______@________.com” from all 302 members. How can I get this fixed? That bounce message probably had more details as to why. If not all we can do is assume that it looked too much like spam and consider rewording or carefully examining the message for spammy characteristics. Messages sent to a large number of recipients have a high chance of being labeled as spam. It might even be your Email Service Provider which refused to send the email as they have specific limits to how many recipients an email can be sent to, to prevent spam. You can use a bulk mailing service to sent to a distribution list. Leo uses Aweber for his newsletters and there is Mailchimp which is free for up to 2,000 subscribers and up 12,000 mailings per month.